I don't know about the rest of you, but I'm seriously jonesing for Outlander right now. I miss Jamie and Claire. I want to know what they are up to, and there just aren't enough teasers on Facebook to keep me truly sated. I just love the characters too much...and Season 3 of the show isn't arriving fast enough. 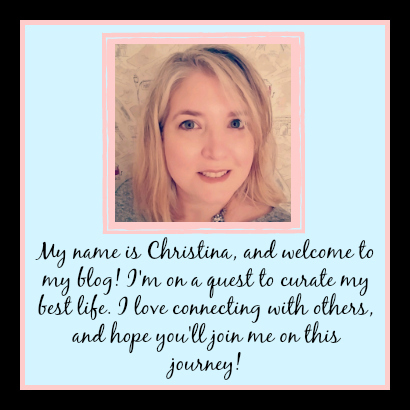 So to fulfill my Outlander cravings of the moment I thought I'd do another Bookish Goodies post...The Outlander Edition! Etsy is a veritable gold mine when it comes to Outlander items, but here are some of my favorites! 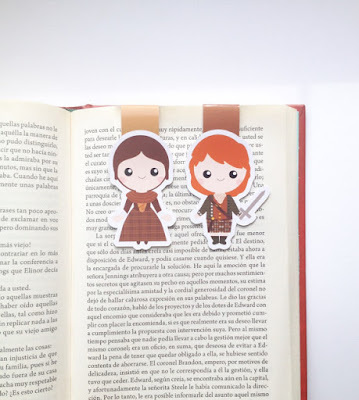 I LOVE these Magnetic Bookmarks, and who wouldn't enjoy this set of Jamie and Claire from HelloPapersCo for $5.99. You can never have enough bookmarks really. If you only knew the stuff I have used recently to mark spots in books...you would laugh your hineys off. But this set is adorable, and a great price too. I'm sorry, but I just noticed she has a PILLOW TOO!! 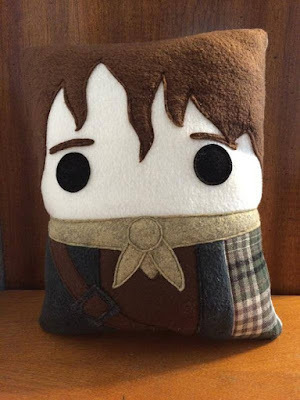 A sweet little Jamie pillow, with his cute little tartan on. This is just too adorable. I can't stop staring at it. I think this might be where my husband draws the line. But if yours is more accommodating than mine, it can be had for $34 from telahmarie. For those of you who didn't know, book themed candles are a thing. If your favorite book has a reasonably decent-sized fanbase, there are candles out there...trust me. 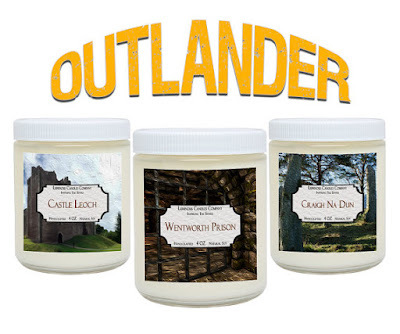 This set of Outlander themed candles, to remind you of some of your favorite Scottish sites, can be purchased from LuminousCandlesCo for $26. I hesitated to think of what the description for the scent of Wentworth Prison would be, but it actually sounds quite nice...not at all like what I thought it would be. Okay, this shirt just makes me laugh. I don't know where I would wear it, or whether my husband would find it funny or if it would piss him off...but this shirt just cracks me up. It can be had for $15.95+ from FNTEES. This is a simple item...just a tiny little love note. 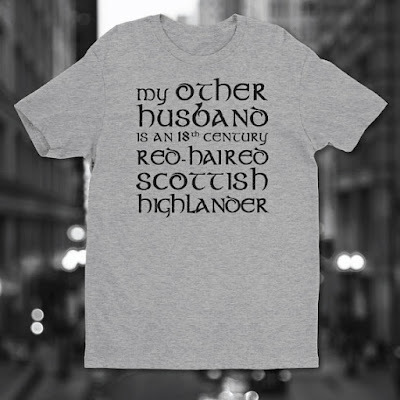 But for the husband of any Outlander fan, it would mean SO MUCH. It's like when I ask my husband if he loves me more than LSU Football. Or when he asks me if I love him more than Pizza. He has seen my eyes when I talk about the Outlander books...and has sat through me watching the Starz show with my girlfriends. He would understand what this meant. You can find it on Etsy for $5.25 from SeptemberProject. 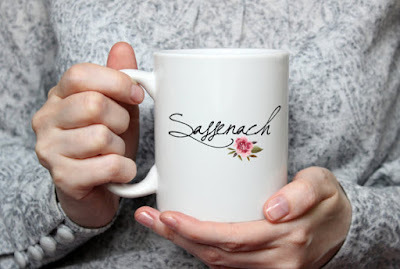 It's a pretty coffee mug...and it says Sassenach on it. I'm not really sure I have to sell it a whole more than that. I'm a bit obsessed with pretty coffee mugs, but I think my husband is going to murder me in my sleep if I buy anymore (not really, he'll just fuss and threaten to throw them away). This one can be found for $15+ from JitterMug. 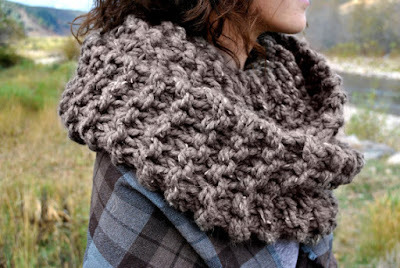 This Scarf modeled after one Claire wears in Season 2 of Outlander is just too pretty not to include on my list. It's more refined and a little classier than the other one, but both are phenomenally beautiful and show both the incredible costume design for the show and the craftsmanship of the people selling their goods on Etsy. 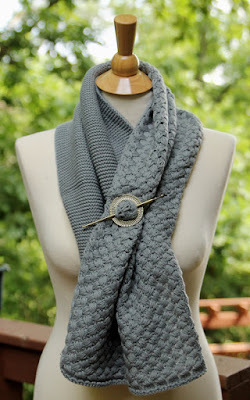 This scarf can be found from KnitPlayLove for $34 without the pin and $46 with. 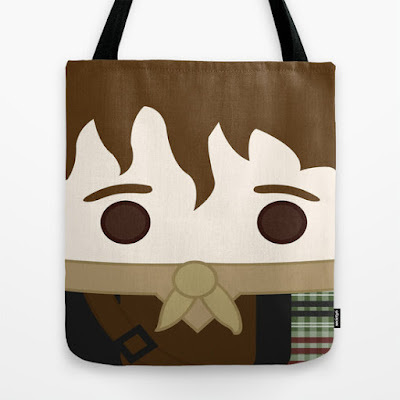 Okay, this one is both on trend and inspired by Outlander. 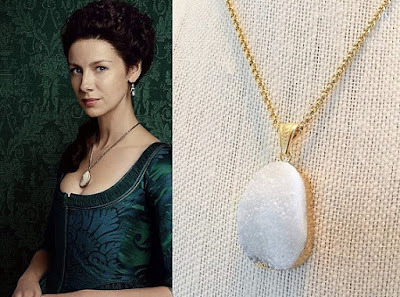 This white Druzy necklace is meant to replicate the "La Dame Blanche" poison detecting necklace that Master Raymond gives to Claire in Season/Book 2 of Outlander...but Druzy jewelry is also very popular at the moment, and this piece would look great anytime. 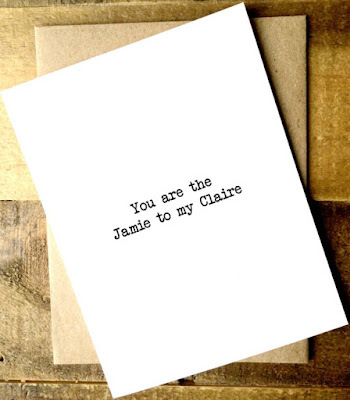 Most people would never know you were channeling your inner Claire. It can be found from DBakerJewelry for $34. My Outlander thirsts are feeling quenched now that I've sat at my computer for ages scouring Etsy, all in the name of helping y'all find some fabulous book inspired goodies. I don't think I have time in my schedule to re-read the entire series right now. I normally do that every couple of years, but my to-read list is a mile long at the moment, and those books are no joke long. So for now perusing the interwebs will have to do it for me. 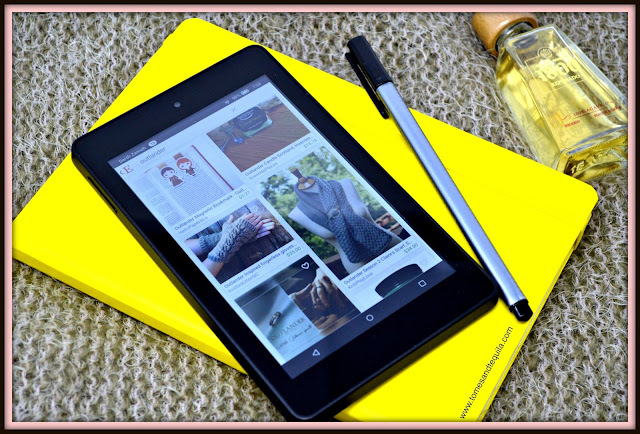 Do you have any good books you'd like me to do a shopping guide for? Let me know in the comments here or over on my Facebook page!